By Daniel Horowitz--There are leaders, and there are those who lead. David Green, who passed away on September 9 at Sunnybrook Veterans Centre, led by example; personifying the best of leadership through his innate ability to inspire and motivate those around him. 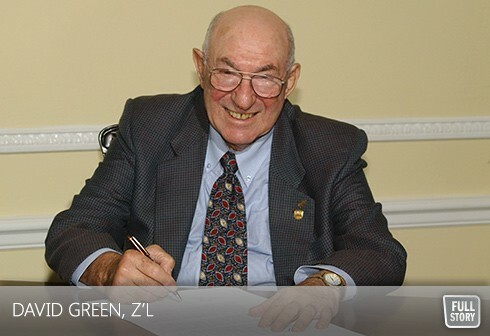 A Veteran of the Second World War, David, who was born and raised in Toronto’s “Junction” area, was a regular at UJA’s Lipa Green Centre where he would take to the phones, canvassing donors and sharing his life stories. And when David Green spoke, people listened. One of 10 children, David joined the Canadian Armed Forces in 1940, serving in the Argyll and Sutherland Highlanders and was MIA and subsequently a prisoner of war in Belgium. He was the first prisoner to be liberated from Stalag 357, just north of Hanover, and when he returned to Canada, David wasted no time in setting an example of volunteerism and tzedekah to future generations. In 2003, David explained his uncommon passion for tzedakah and UJA in his Book of Life story, The Jewish Foundation’s archival collection of stories from those who have left a legacy to ensure the future of Toronto’s Jewish community.